Trumpet vines are stunning flowering perennial vines that can completely cover a fence or wall in brilliant orange blossoms. 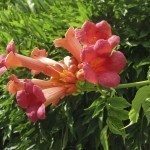 Trumpet vines are very hardy and pervasive – once you have one, you will likely have it for years, possibly in multiple parts of your garden. Though care is easy, it’s not completely hands free. Trumpet vines do have certain watering needs you’ll need to take care of if you want a happy, healthy plant. 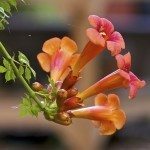 Keep reading to learn more about trumpet vine water requirements and how to water a trumpet vine. How Much Water Does a Trumpet Vine Need? Trumpet vine water requirements are pretty minimal. If you’re looking for a spot to plant your new trumpet vine, choose one that drains well. Wait for a heavy rainfall, then examine the soil in your garden. Choose a place that drains quickly, and avoid areas where puddles form and hang around for a few hours. When you first plant your trumpet vine seedling, give it plenty of water to soak the root ball and encourage new shoots and roots to grow. Watering a trumpet vine in its early days is just slightly more intensive than usual. For the first couple months of its life, water your trumpet vine thoroughly once a week. 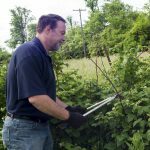 Once it’s established, trumpet vine watering needs are minimal to moderate. During the summer, it needs about an inch of water per week, which is often taken care of naturally by the rain. If the weather is especially dry, you may need to water it once per week yourself. If your trumpet vine is planted near a sprinkler system, it likely won’t need watering at all. Keep track of it and see how it does – if it seems to be getting by without any watering on your part, leave it alone. Water your trumpet vine lightly in the fall. If your winters are warm and dry, water lightly through winter as well.